Wilson Junior High, and the LethbridgeCollegiate Institute for his grad school years. He has actively participated in several team sports with his favorites being football and basketball. He served a full time mission for The Church of Jesus Christ of Latter Day Saints for two years in Brazil at the age of 19. Dr. Nelson is married to Wendy who also grew up in Lethbridge. They have three children, Brady, Krista, and Harper. Dr. Nelson’s formal education includes a Bachelor of Science in Exercise Science from BYU (Brigham Young University), a Bachelor of Management in Marketing form U of L (University of Lethbridge) and his DDS degree from Marquette University School of Dentistry in Milwaukee, Wisconsin. The community involvement Dr. Nelson is volunteering in shows his commitment to the community he lives in. He is on the Lethbridge Minor Basketball Association Committee, coach for the Lethbridge Ram Pee Wee Minor Football Team and actively serves in his church. His hobbies and interests include coaching, playing basketball and all sports. Dr. Nelson loves to spend time with his family. 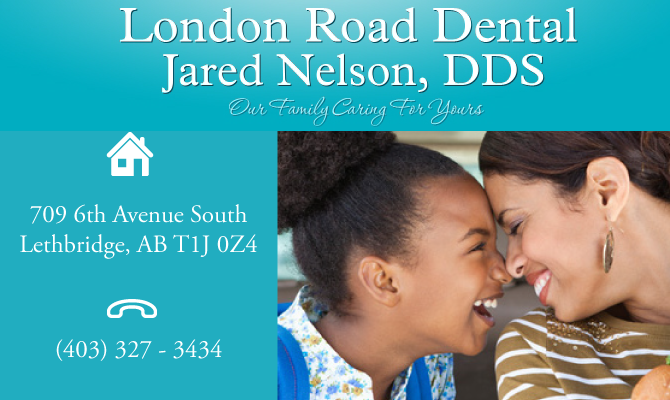 Dr. Nelson’s demeanor, down to earth personality, and gentle care make every patient’s dental experience a positive one.